Rittenhouse Archives is pleased to announce that the first full series of trading cards for the Stargate SG-1 spin-off show Stargate: Atlantis is to be released on September 29, 2005. 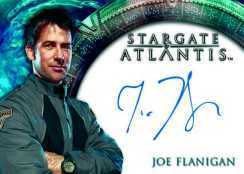 Show stars Joe Flanigan (Major Sheppard) and Paul McGillion (Dr. Beckett) will be signing autograph cards to be found exclusively in the Stargate: Atlantis Season One Trading Cards series. We�ve crammed this product with lots of value, including 1 autograph card AND 1 costume card per box. Based on the rapid sellout of ALL of our past Stargate SG-1 products, we very much expect another quick sellout! Each box will contain at least 1 autograph card and the lineup is top-notch with over a dozen signers! In addition to Flanigan and McGillion, we have included a number of recurring, key guest stars including Colm Meaney (Cowen), David Nykl (Dr. Zelenka), Boyan Vukelic (Sgt. Stackhouse), Craig Veroni (Dr. Grodin), Christopher Heyerdahl (Halling) and others! Along with an autograph card, each box will contain one costume card featuring all of the major characters from the show including Major John Sheppard, Dr. Elizabeth Weir, Teyla Emmagan, Lt. Aiden Ford, Dr. Rodney McKay, Dr. Carson Beckett and more! Also randomly inserted into boxes of the Stargate: Atlantis Season One Trading Cards will be several exciting bonus sets, including The Quotable Stargate: Atlantis cards, Ancient Technologies cards, Atlantis Crew cards and Fallen Hero cards. Each box of Stargate: Atlantis Season One Trading Cards will contain 40 packs with a suggested retail price of $2.10 per pack and $84.00 per box. The 63-card base set will cover all 20 season-one episodes with complete plot synopses and exciting imagery. Fans and collectors will also be able to store their collections in a custom designed collector's album, which will retail for $39.99, and contain an exclusive autograph card signed by Alan Scarfe as Chancellor Druhin. Rittenhouse Archives, Ltd. is a leading producer of science fiction and fantasy based trading cards and related collectables. Our licenses include Star Trek, Battlestar Galactica, James Bond, Xena: Warrior Princess, Stargate SG-1, Farscape, Twilight Zone, The Six Million Dollar Man, Conan, The Dead Zone and Lost In Space.